Red Copper® Square Dance® | Official Site | All-Purpose, Non-Stick, Copper Square Dance Pan With 25% More Cooking Space! 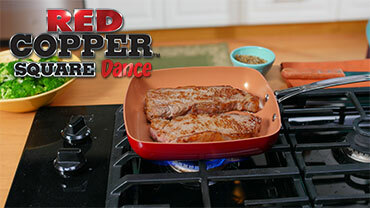 Cook Without Oil, Butter, Or Grease When You Use Red Copper® Square Dance®! No matter what you cook, food dances right out of Red Copper® Square Dance®. Clean up is so easy! Whether you have gas, glass, electric, or induction, Red Copper® Square Dance® works. Tired of food sticking to your pans? Tired of all those scratches? The Red Copper® Square Dance® uses the newest technology in nonstick cookware! READ FULL DESCRIPTION Red Copper® Square Dance® is made of ceramic and super strong copper ensuring no food sticks. Nothing sticks, so you can just wipe off your food. The square design gives you extra cooking space to fit more food. Plus it's oven safe up to 500 degrees F. Red Copper® Square Dance® is 9.5", lightweight, and super strong. It won't scratch, chip, or peel into your food. Red Copper® Square Dance® is perfect for everything - cooking pasta, baking golden bread, and so much more! You can get your Red Copper® Square Dance® today for just $19.99 and shipping and handling for $9.99. When you order, you will also receive the Quick Meals and Desserts Receipe Booklet for FREE. And that's not all! Take advantage of our SPECIAL OFFER and get a second Red Copper® Square Dance® for a separate fee of just $9.99. Your order will also be covered by a 100% money back guarantee. This offer won't last long so get yours today! Place your orders today! Refer To Stove Manufacturer's Instruction Manual Before Using on Glass Cooktop. Square Cooking Area Gives You More Space To Cook! Red Copper® Square Dance® is your griddle, roaster, fryer, skillet, and more! Works On Any Stovetop Surface - Gas, Glass, Electric, And Induction! Hear from other Red Copper® Square Dance® customers how much they love it, and why you will too! Check out all the news for Red Copper® Square Dance® and its creators featured all over the world.